Hang up your coat and stay awhile! Feel free to relax on the couch and chairs, or get some work done on your laptop at the cafe table. For those with infants and young children, we have a small play area with a mini train table and toys. 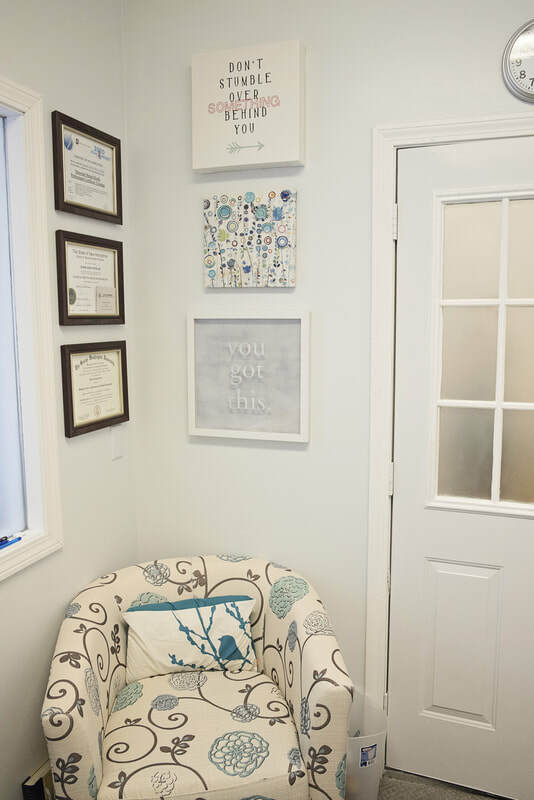 To keep everyone comfy and happy, we offer a private area to feed, snuggle, or change your baby in our nursing nook. Used for PT, OT, and Mental Health Counseling (yup, you read that correctly! ), our sensory gym has plenty of room to run and allow your kiddo to get their wiggles out, at the same time remaining calm and inviting for kids who may feel overwhelmed by large spaces. While you're here, please make sure to take a peek at our gallery of beautiful photography, generously provided by Jennie Bishop of White Wave Photography. If you're trying to find Susie, look no further! She uses this cozy, comforting room to see the majority of her clients. She also uses the gym when parents come in for therapy along with an active little one.